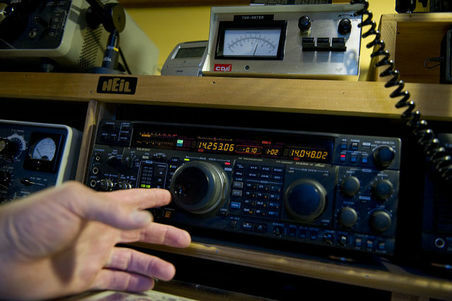 "Where Metro meets the Mountains"
Cherokee Amateur Radio Society is an organization of FCC licensed amateur radio operators (also called Hams) that meet and share the hobby, educate people about amateur radio, as well as support our local community in times of disaster. 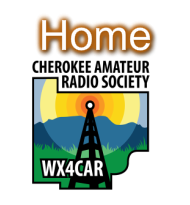 We are located in Cherokee County Georgia and have club call sign WX4CAR. The club also participates with ARES, and the Cherokee County EOC when severe weather gets close to the area, and we help with local public service projects. The members of the club also dedicate some of their time to promote and help new hams to develop their skills and knowledge on Amateur communications modes and to be better operators. We are a very active club and participate in ARRL Field Day every year. If you are in the Woodstock, Georgia area and would like to participate, drop us a note and let us know. This website will provide details about the Field Day site. The menu tabs on the left will help you navigate to the area of interest. If you have a question and would like to contact us, use the button here to go to the Contact Us page. We operate under the club call sign WX4CAR, or a special call sign for our club sponsored events. Field Day 2019 we will be K4R. Field Day 2019 is just around the corner! Do you want to be part of the planning committee? We will be forming the committee starting in March. Contact Club VP , Rob Bruderer (W1JKU) for more details. Testing - Need to test for your license or upgrade? An ARRL Testing session will be held at 2PM the same day. Testing is done at the William G Long Senior Center. Walk-ins are welcome, but we like reservations. Click on the Contact Us button if you want more information. What would you like see in 2019? The club officers will be looking for your suggestions, ideas, and participation. Field Day 2019 - make your plans now to participate. Ask s club member. If you have a topic you would like to present to the club, please provide a summary or abstract in writing to any officer. It needs to related in some way to amateur radio. If you miss a meeting, you miss a lot! Topic for the January meeting was centered around microcontrollers for Ham radio projects. Almost every time you open QST magazine you find project that the uses a microcontroller. Anyone needing help getting started can just ask. We have at least 3-4 experienced people that can help you get started. Slides are posted. In February we had session on antennas, in particular NVIS (Near Vertical Incident Skywave). This is a topic of interest to everyone these days. For those in ARES it is an important skill and knowledge to have. Bob Chambers (KK4JPM) presented and slides posted. In March we were treated to a special presentation from Wendell Abernathy N4VLK. He talked about "Try Something New! – an introduction to DXing, Contesting, and QSL Card exchange". For those who are new hams as well as many of our members who haven’t ventured far from VHF and a little rag chewing, here is another whole part of the hobby you may find fun and exciting. Wendell shared his experience and wealth of knowledge. Slides are posted. Want to present to the group? We NEED members willing to present on a topic in an upcoming meeting. Per our survey, topics include DIY projects, various aspects of soldering, batteries and solar power, working ham radio satellites, and using microcontrollers in your project. Please contact Marty, Jim, or Joseph Ladd about your topic. What do you want to see presented? Let the leadership team know. Look for new sessions and all new topics in 2019. Submit your ideas to any club officer. Slides are still posted for the 2017 and 2018 sessions from early in the year. We hope to do the club "build it" project. The Ham Radio Workbench website has a number of DIY projects you may want to try. WE are here to help. I have a list of who is seriously interested in doing projects. Plan is to have a "build it session" in 2019. What do you want to build? Tell us and we will plan to help.